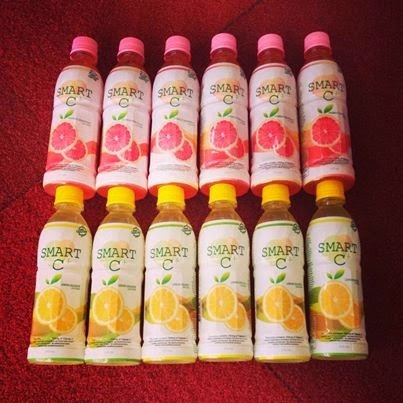 Yes, that's what is written on the label of Oishi's Smart C+! I am one who doesn't believe much in popping vitamins (pills). I'd like to get my vitamins naturally - like in juices and in food! For one, I LOVE milk and so I drink it everyday - and that's my natural dose of Calcium. But for Vitamin C, well - I have to confess, I rarely drink OJ, and even if I make lemon water, I doubt that its enough of a dose. I'm glad to know that a local brand - Oishi is now offering a Vitamin C+ a thirst quenching alternative to those pills!! Please note that this giveaway is open to Metro Manila residents who are willing to meet up to pick up the prize in Quezon City - specifically, Trinoma Mall, Robinson's Magnolia, SM North and Fisher Mall. I also beg you not to force me to sponsor shipping to your address. I will pick the winner myself and use Rafflecopter to collate the entries. 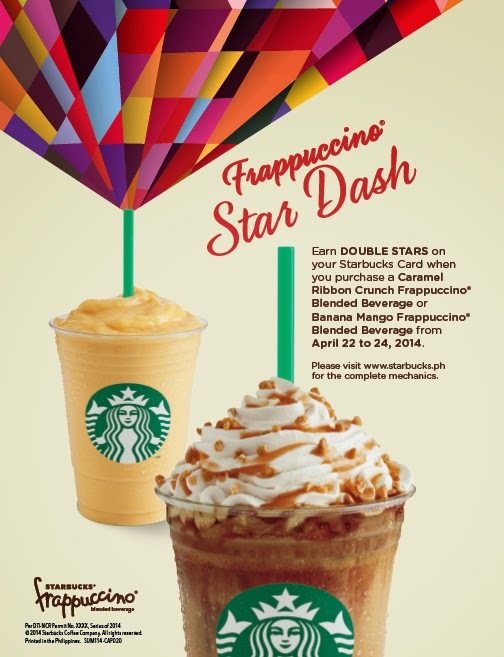 Say YES to Starbucks' Caramel Ribbon Crunch & Banana Mango Frappuccino!! Its officially summer! And in the sweltering heat - a refreshing drink always cools us down. 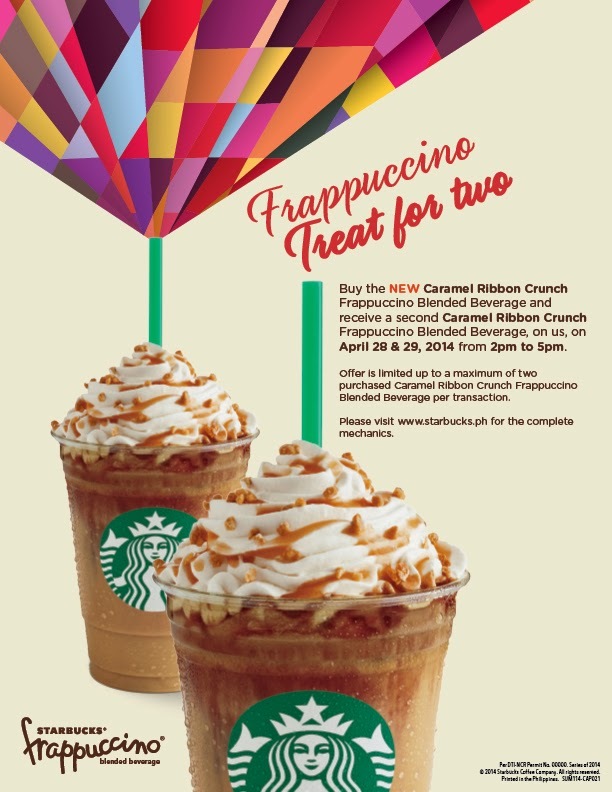 The folks at Starbucks have two new drinks in store for us - the Caramel Ribbon Crunch and the Banana Mango Frappuccino! 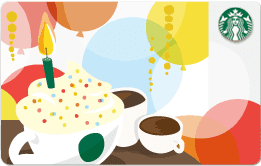 I am so very excited to share that starting April 22 - we will be treated to a taste the Caramel Ribbon Crunch and the Banana Mango Frappuccino! What a great treat for the summer!!! 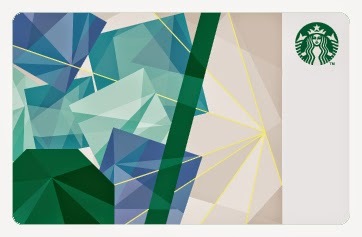 To those Starbucks Card collectors, here are two new designs to collect! What a perfect birthday gift! Another wonderful design to commemorate the season! So head on to Starbucks on the 22nd! See you there!! Since Kailee and Connor have Skin Athsma/Eczema, its quite a normal sight to see rashes on their skins from time to time. I've tried so many lotions, foreign brands, local brands, eco friendly brands, natural brands and nothing has worked to completely eliminate the skin asthma. I've accepted the fact that to treat the rashes, I needed to put medicine/steroids on them, but just for a short while. When the rashes disappear, I immediately stop with the medicines. Two weekends ago, while we were in Bohol - I noticed that Kailee had this small red dot on her thigh, it looked like an insect bite, so I dismissed it and put a natural remedy. Whenever I caught her scratching it, I would tell her to stop. Before she went to sleep, I put a mild steroid cream - Synalar 10 on her. The next day, it looked a bit better and so I stopped. When we got back to Manila - the rash looked a bit bad. I gathered that Kailee must have scratched it, so much that it got worse. So I just dismissed it and put on the cream. The following day, gosh - the once medium-ish red dot was so much worse! It looked like Kailee's skin got burned because it the skin was peeling off! And the size of the rash, it went from a 5cents coin to 2inch diameter scab! It looked so bad that I had to bring her to our Pedia Derma, Dra. Rowena Francisco the next day. When we went to Dra. Rowena, she noticed immediately the small scabs on the back, and arm. Then when I showed her Kailee's right thigh, she immedaitely told me that it was caused by bacteria already. She immediately diagnosed Impetigo Contigiosa and began showing me pictures of it it in her medical book! They looked really scary to be honest. Dra. also mentioned that this was contagious especially if there's skin to skin contact. So better that we isolate Kailee with Connor or to wash hands every after contact with Kailee. And that as much as she would like to just use a topical anti-biotic, the rash was too big already and it was spreading. She told us to take oral antibiotics already. She said that after 48hours of taking anti-biotics, Kailee won't be contagious anymore. We started her antibiotics right away. To dry up the scars - we were instructed to mix a teaspoon of clean salt in two glasses of water. To dip a flattened cotton (enough to cover the whole area of the scab), wring it (take out the excess salt water solution) and place it on the scab for 5 minutes. We needed to do this three (3) times a day for 7 days as well. Today, her scabs have dried up. We've completed our seven (7) days of antibiotics. Thank goodness for the antibiotics and the salt water solution! So what is Impetigo Contigiosa? Impetigo is a skin infection that occurs most commonly in children and babies. Because impetigo primarily affects school-aged children, it's often called school sores. Most cases of impetigo occur during warmer weather. Our pedia derma said that Impetigo Contigiosa usually happens when its summer time, more specifically humid and warm climates. She has seen quite a number of patients with Impetigo Contigiosa since March of this year. She reassured us that its quite normal and that we have nothing to fear because its treatable. Well, yesterday - a HOLIDAY, I got a call from our guard early in the morning. He informed me that there were Maynilad contractors outside and they were going to change all the meters to new ones. Since they will change the meters, we will not have water for an hour or so. Of course, I couldn't say no right? After while, I got another call again telling me that they will need to remove the grills protecting the meters (our water meter was stolen last year). I refused to have them take out because it was just the meters that will be replaced! So, I went to the gate to inspect and argue my point. When I got to the gate, they told me that they will also be replacing the tubes. I was irritated, I told them why not tell the whole tale - that the meter AND the tubes will be replaced so that I would know the whole story, instead of giving me the details in bits! Argh.. So there, I agreed for them to take out the grills provided that they will put it back themselves. It didn't end there! When they took out the three (3) meters, I was told by the main Maynilad contractor that one of the meters was defective. Of course I argued otherwise. He then said it was because the meter was still in '0'. I told him that, that particular meter for wasn't being used, that no one uses water on that particular meter. He looked at me as if I was silly - I then challenged him, to go to their office and to inquire if the meter has moved, or if we have been charged for consuming water on that particular meter. I then reasoned - that that's specifically why we have 3 meters around! I was already irritated when he accused this of us. And right after, he asked to see receipts! WHAT THE HELL FOR? He said that he didn't have the account numbers for the other 2 meters. This was the silliest request ever - I told him, if they just had only ONE (1) account number = 1 meter to replace, why replace all three and claim that they don't have the account numbers? STUPID if you ask me, and he was stumped and became quiet. 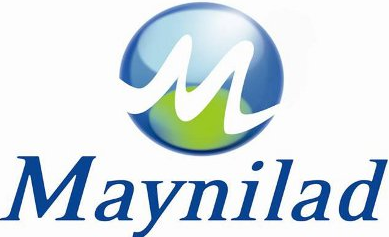 Hay nako, Maynilad. If you knew that there will be replacement of meters and tubes, don't you think you can inform us ahead of time so we can expect the 'down time'? and not surprise us suddenly of these changes? You demand right there and there to have our meters replaced without informing us! What kind of customer service is that?? Also, along Del Monte Street - you have been doing repair works ALL YEAR ROUND, destroying the perfectly good asphalt on the street and digging like crazy causing traffic and so many inconveniences to us! Do you even know what you are doing? Because it seems like you do not - I mean repairing the same things over and over? Isn't that costly on your part? Is it because of contractor kickbacks?? Last December, I was given the chance to stay at The Bellevue Manila and I was impressed with the kind of service that was given me. I have mentioned in my previous post that what I experienced was hospitality at its Best. And so when my in laws told us that we were going to stay at The Bellevue Resort in Bohol - I was thrilled and excited! At the airport, we were welcomed by a TBR (The Bellevue Resort) staff - he welcomed us with a warm smile and giving us shell necklaces and cold bottled water (which was very refreshing!). We waited a few minutes (getting our bags and loading them in the van) and we were off to The Bellevue Resort. The ride was a good 40 - 45 minutes, this is without traffic. When we got to the resort, we were impressed at the lobby because it was something we didn't expect to see. I was expecting to see a modern resort looby - but what welcomed our sights was a nature inspired lobby. It wasn't enclosed and instead used the space to create a wonderful nature-esque inspired lobby. It actually reminded me of the JW Marriot Resort in Phuket. Seeing the lobby alone - I was already impressed. The weather was not very hot - but it was sunny and the winds were nice. The clean air was refreshing and seeing the sea and the pool - it was such a pretty sight to behold. I knew what kind of vacation we were to expect. I checked in my whole family, Cecilia the staff who assisted me was very warm and welcoming. I first asked if the resort was full and she said they were quite full - I followed up with a request, if she can upgrade our rooms - to which she replied that she can only upgrade one of the rooms to an ocean view one, but it was a king size bed. I knew that I had to give this to my in laws, as they deserved it. Unfortunately, this particular room was still being cleaned as we checked it. Cecilia told me that she will inform me as soon as the room is ready. I distributed the room keys and in minutes, we were settled in our rooms. The rooms are quite big. In my family alone, it was my Panget, myself, Kailee, Connor and Yaya Belen. We requested for a room that had two queen sized bed and it was given us. There was still ample space for Kailee and Connor to move around and about in the room. I have to be honest, I hate cramped hotel rooms and so seeing how big the room was - I was delighted. The room wasn't carpeted, this for me is very practical - especially since it was a resort. It would be a logistical disaster for the management to be make the rooms sand free since there's a beach! But mind you, a carpeted hotel rooms exudes a different feel - sorry, being in the carpet business, well - I know how to sell the idea. Hahaha!! When we got to the room, the aircon wasn't as cold as we expected. We assumed that since we just came it - the aircon was just turned on. We settled in and rested for a bit. The room was complete with the usual hotel things. It had an electric kettle (with instant coffee, tea, sugars and creams) a mini ref that held some drinks, complimentary rubber slippers that cam in two sizes (one for male and another for the female). The bathroom was pristine clean. I especially liked the sink because I've never seen anything like it before. It had both a bath tub and a shower (with rain shower and telephone shower head!) One thing I noticed in the room (which is brilliant) is that the room had its own breaker (which was hidden in the closet) It meant that the room had its own control on the electricity! Great idea right? After having our lunch, we went back to our rooms to rest. The kids went to sleep while my Panget and I walked around the resort. We walked around the pool and went to see the play area for the kids and adults. It was a good idea to have this in the resort. I honestly was skeptical about this but then, when I saw it - well, it was a great idea! It was another activity that the family can do aside from swimming in the beach or in the pool. So for those with kids in tow - infant, toddlers and young adults well, they won't get bored. There's an air hockey table, a ping pong table, a foosball table, two Playstation areas and a kid's play area. I promise you, you won't be bored. After trying the tables ourselves, we decided to head back to the room. When we got to the room I noticed something on the table. It looked like the sandwich that I left on the table/counter was filled with ants. I followed the trail of ants and found that, the ants came from an outlet, the one allocated for the electric kettle. I called the guest services to inform them and in less than two minutes, housekeeping staff were up in the room and were cleaning up. I was amazed at how fast they heeded my request of a clean up. As we were leaving for the pool area, a housekeeping staff returned to our room and asked us if it was okay to spray something in the room (it was for the ants) since we were going to swim, we said it was okay. The pool was so inviting and lovely. My family, especially my kids had a wonderful time. I liked that the pool had labels on the depth of the pool in certain areas. I especially liked the tiles of the pool because it looked so blue and it was inviting as hell and it complimented the backdrop which was the beach. When we got back to the room, I noticed that the aircon was still not cold. I called the guest services to ask if they can have someone check the AC because it was still not cold. Again, in less than a minute - the maintenance guy came. He checked on the AC control panel and within seconds declared 'Ma'am, aircon is not working. Are you willing to transfer rooms?' Of course, I had to agree. I was impressed that a maintenance staff was able to decided right there and then of a room transfer. After a few seconds, we received a call from guest services that we were being transferred to another room at a lower floor, but this time - we were being upgraded to an Ocean view room. In a few seconds, a front desk staff was at our doorstep with the new keys to our new room! We hurriedly packed up our stuffs but the front desk staff told us not to worry, that his people will take care of it. And they did - they did all the packing and hauling, we just waited less than five minutes for them to arrive at our new room. With this service alone, I was beyond impressed already. I knew that TBR was training their people very well because they were very helpful and everyone was all smiles. Impressive! That night, we had a wonderful sleep - the room was cold and the bed was so very comfortable. We slept like babies! I had to wake everyone up because we were going on tour that day. We went down to have breakfast at Lamian and the spread was wonderful! It wasn't overpowering and I felt that it had a balanced selection. The restaurant staff were very alert and gave us a high chair once they saw that Connor was with us. They were very attentive to our needs and kept going back to ask if we needed anything else. My yaya said that she felt that she was well taken cared of at the restaurant. Fernan the hotel staff at Lamian and Marea is very attentive and helpful. One of the things that I liked was that the server Malyn was very gracious to accommodate my request to bring some take away food as Kailee wasn't in the mood yet to have breakfast. I appreciated that gesture very much. Before we left for our tour, I met Mr. Rommel Gonzales, the resident manager of the resort. He was very pleasant and even gave me his card and told me to call him on his private number for any concern. I appreciated this very much - that he gave his personal touch and was very willing to extend help to me and my family. That night, we had our dinner by the beach. The Bellevue Resort prepared this Earth Hour celebration with a program to entertain their guests. The buffet spread was wonderful - they kept on refilling like there was no tomorrow! I especially enjoyed the pizza, as it was baked in an authentic brick oven. The selection was really good, again - it was balanced. Quality instead of quantity if you ask me. I think most everyone was enjoying and having a great time! You can feel the high energies and spirits of the group! The program was well on its way, when it suddenly drizzled - making guests hurry inside the hotel for cover. It was quite funny because the resident manager, Mr. Rommel Gonzales- was just discussing in his speech earlier in the evening, that the weather that night was cooperating because the previous times - it rained! And it did. The experience was unforgettable and at the same time enjoyable because it has been a long long while since I dined al fresco by the beach! We all turned in early that night because we were so tired from our tour. My son was knocked out first and then my daughter. I think I was the last one to turn in because I was still watching TV! I was so looking forward to sleeping because the bed was so inviting and the room was very cold. The room felt home (away from home) because it was so comfortable. I woke up though, feeling a bit warm. I looked at my phone and saw the time it was 2:30+ in the morning. I noticed that the room's AC was turned off. I thought maybe there was a black out, but there were lights outside the room and in the closet. So I went to the AC controller and noticed that there was no display. I pushed the power button and nothing happened. I called guest services (Honestly at that time, I was expecting there will be no one to help) and someone answered, it was Mark. I told him that there was something wrong with the AC and he sent up a maintenance guy to check. Within minutes there was a knock on the door, he checked the AC controller, took it out and noticed too that there was no power. He turned to me and asked if he can go into the balcony to check the compressor, I said yes. So he left and got the keys, and when he came back, he tinkered with the compressor. I think he must be doing something right because I can hear the AC powering up, but then after less than 5-10 seconds, it shuts down again. After a few futile attempts, he declared that there was indeed something wrong with the AC's compressor. He called superior and informed him of such. Within a few minutes I got a call from Mark informing me that we will be transferred to another room on the same floor, just almost across our current room. So I woke up my Panget up and told him that we will be transferring room, I woke up my Yaya and told her to bring Connor to the new room. Within minutes Mark was at our doorstep with keys to the new room, he kept on apologizing. I reassured him that it was alright because no one wanted the AC to malfunction, it was just unfortunate that it happened. The next morning, we got so many apologies on the incident. I kept on telling them it was alright because it an unfortunate incident, and I understood that these things happened. I commended them for their efforts and their efficient service. I was telling them that considering the time and the limitations they had, they were able to address the concern super fast! And that alone impressed the heck out of me! I mentioned to them that it only means one thing - that the owners trained them very well. The incident speaks volumes on the kind of training and service that they have. I will say it again, this should be duplicated by the local branches of the international hotel chains! Overall - we had a marvelous stay at The Bellevue Resort. We would love to come back again for the facilities, the tranquility of the place and most of all the service! If you value your privacy, this particular resort is for you. The place is quiet and free from random people roaming around the place and the beach. The Bellevue Resort reminds me so much of the JW Marriot Resort in Phuket where I stayed at in 2005 (right after the Tsunami). The Bellevue Resort is just the right size and considering that this is a locally grown hotel chain, I am impressed by hundreds of miles. Once you enter the grounds of the resort, you will feel the warm Bellevue Hospitality. Experience it to believe. I promise you, you will be blown away with the kind of service, the warm smiles and the sincerity. The Bellevue Resort is world class! My daughter loves the water so much. Yes, when she was still an infant, she loved taking a bath! When she was diagnosed with Skin Asthma/Eczema, we were advised by the doctor to bathe at least twice a day - and she loved it so much! But even if she loves the water - she was afraid of the pool. Well a real actual swimming pool that is. We would bring her to my sister in law's pool (at her condo) and she would hang on to my Panget's neck for dear life! But she enjoyed the water very much. So last January, when we knew that we were going to Bohol, my Panget insisted to enroll her to the Aqualogic swimming class. My two nieces were schooled here (including my nepher) - and they are now very confident in the water. The first three classes were so stressful. During the first class, she was so excited to see her baby cousin in the pool! But when it was her turn to swim (my Panget was in the pool with her), she was crying and semi screaming! It took her a two more lessons to become more comfortable. The second and third session was a struggle. She would be excited at home and once we reach the pool area, she would refuse to go into the pool. I was honestly losing hope that she would enjoy her sessions, but once when I had to be in the pool with her (my Panget was indisposed) she felt a lot more comfortable. After that session, I made it a point to be with her in the water because I felt that she was enjoying her time in the pool more. I do hope that being with me made her more confident in the water. So, last weekend we were in Bohol. And she was so excited for the pool. I honestly wondered what she would do! And well, I am happy to report that she was so confident with herself that I was afraid that she might jump into the deeper pool and drown! She was so confident, no fear - all smiles and was so eager to immerse herself in the water. We actually got some cute shots of her underwater. Pictures to follow. I am posting a video here of her being underwater. I know she still doesn't know how to swim (float and kick) but the confidence she has in the water is very admirable if you ask me. I am a proud mom! I am so proud of her! Thank you Aqualogic for making my Kailee enjoy and love the water! Thank you Teacher Ria! I am now a believer in your methods! My kids have skin asthma/Eczema thus, I need to be careful with the products that I use on them. For soaps, I've tried so many soap, shower gels and the like - I am currently using Dove Baby on them because its the only one that I found that is okay with their skin. Last weekend, we were at Bohol - I brought with me a BioPha Organic, a soap free Shower Gel to use on myself. But while I was bathing Kailee, I had this idea on using it on her. Just to try and see what happens. And so I did. And it was wonderful! Kailee didn't itch, nor did she have rashes or dry patches after her shower. She slept through the night without scratching. I initially thought maybe it was just a first timer's luck, so on her next bath - I would try it again. So the next day, before going on our tour - I used it on Kailee. And I was amazed because she never felt any itch the whole day! She was so well behaved and did not complain of itchiness! She didn't scratch at all - she felt really comfortable despite the heat! The shower gel helped ease her eczema! I'm so happy that I finally found an alternative to my usual soap that is eco-friendly and gentle! It took me more than 3 months to try it on her. It was only last weekend that I had the guts to try it on her! Another great thing about this particular shower gel is that you don't need so much to use on the body! A little goes a long long way! Try it to believe! I am a believer because I use it too on myself too! !